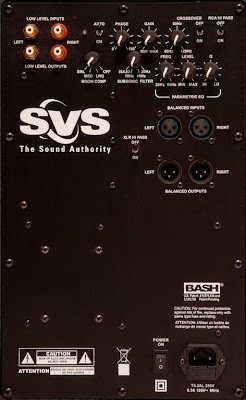 Ron Stimpson and Tom Vodhanel started SVSubwoofers (now SVSound; SVS for short) the way a company should be started: build high quality but keep the price low. Now, a lot of companies have claimed to do this, but SVS really stuck to that mantra. Of course, selling only on the Internet makes this somewhat easier because the dealer markup is cut out of the equation. Nevertheless, there are products out there, sold on the Internet, but they are still about the same price as if you bought them in a brick and mortar store. 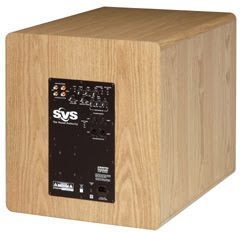 SVS began by selling subwoofers that were built like tanks and put out enough deep bass to kill all the cockroaches in your home theater, but were priced so virtually anyone could afford one. After almost a decade of great success at this, they have not changed that business plan. I think part of this is due to really having a passion for bass, not simply wanting to build a company. In fact, that passion appears to have priority over profit motives from what I have seen. Secrets has tested many SVS subs over the years, and we have always been amazed at the quality of each one. 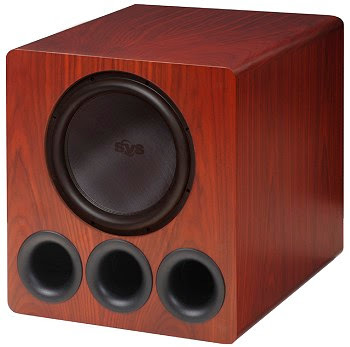 The cylindrical subs that SVS first marketed are still part of their line. 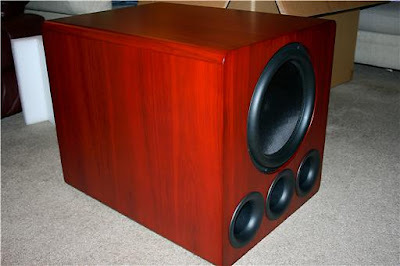 Box subs were added a few years ago, and speakers have recently been introduced. Thus, the name change to SVSound. One of SVS' newest subwoofer models is the PB13-Ultra, which is the brain child of in-house engineers Stephen Ponte and Jim Farina. It is available in several finishes, including Oak and Rosenut, as shown in the photos. The basic price is $1,499 for textured black, plus $99 for shipping, so the total cost to the consumer is $1,600. This is a true bargain . . . just wait until you read how it performed here in our labs. The reason for the name on this one is the 13.5" driver. It is that size to maximize the cone area in relation to the enclosure volume, and it gives you a true 12" of piston diameter compared to conventional 12" drivers. The driver does not end just with an extra inch and a half in size. It is capable of 3" excursion, which means it can move a lot of air. A huge magnet rounds out the design, and that is why the PB13-Ultra weighs in at 155 pounds. You can see from the photo that there are three ports - each one is 3.5" in diameter - on the front of the enclosure. You have your choice of the metal perforated grille, as shown, or the conventional cloth grille. The amplifier is rated at 750 watts RMS. Besides the usual adjustable Phase and Volume controls, it has selectable Room Compensation (selectable depending on the size of your room), Subsonic Filters (for use when you "tune" the sub by plugging one or more of the ports with the three included foam port plugs), and a single-band Parametric EQ. There are XLR as well as RCA line-level inputs and outputs (you can turn the high-pass through these jacks on or off). 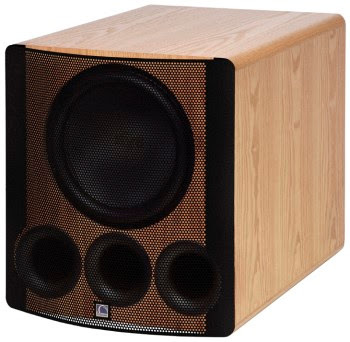 All in all, one of the most flexible subwoofer amplifiers I have ever seen.